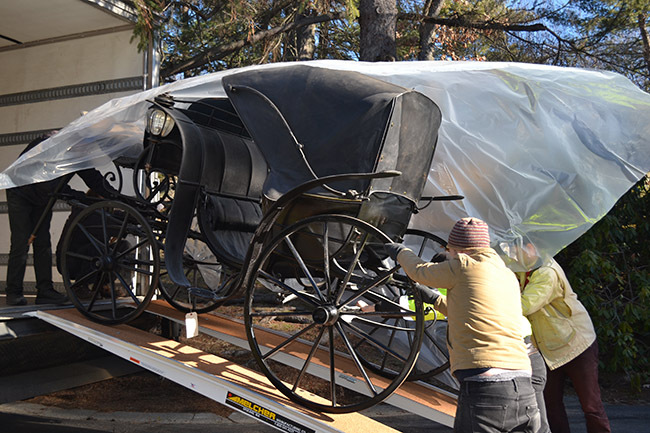 Part of a recent generous gift to Longyear from The First Church of Christ, Scientist, in Boston, Massachusetts – a gift that included two carriages and a boat that belonged to Mary Baker Eddy – the Victoria carriage arrived at 400 Beacon Street earlier this spring. 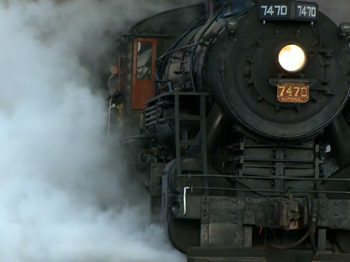 It will be stored in the Carriage House. Movers from Fine Arts Enterprises, Inc. deliver Mrs. Eddy’s Victoria carriage. 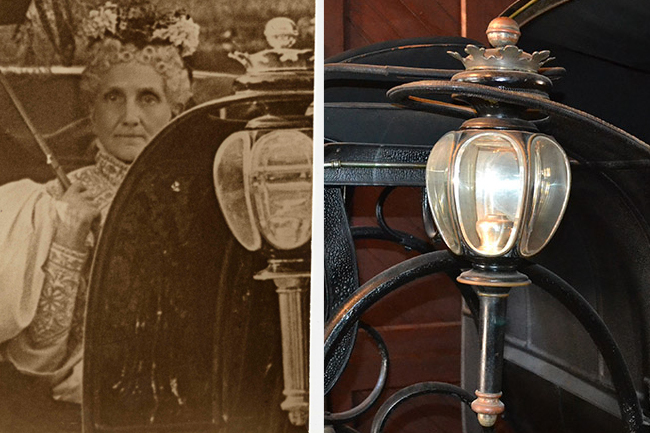 Known for its graceful lines and elegant style, this light two-seater, named for Queen Victoria, was a popular ladies’ carriage in the 19th century. The carriage is wheeled carefully onto the driveway at 400 Beacon Street. 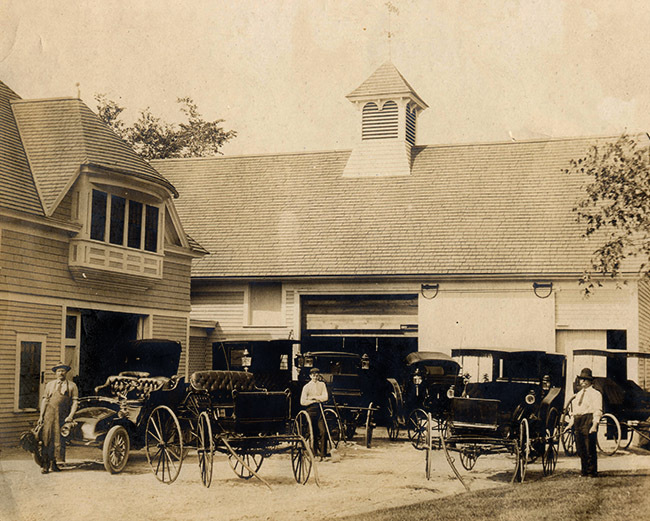 The Victoria carriage (rear center) parked in the stable yard outside the Pleasant View barn in 1904. Photograph, P6283-1, Longyear Museum collection. 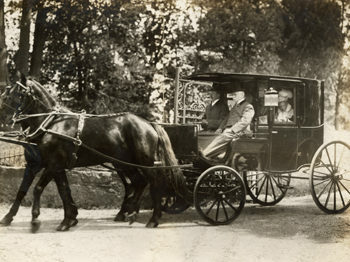 Mrs. Eddy’s Victoria was purchased from Loud Brothers’ carriage manufacturers of Merrimac, Massachusetts, while she was living at Pleasant View. 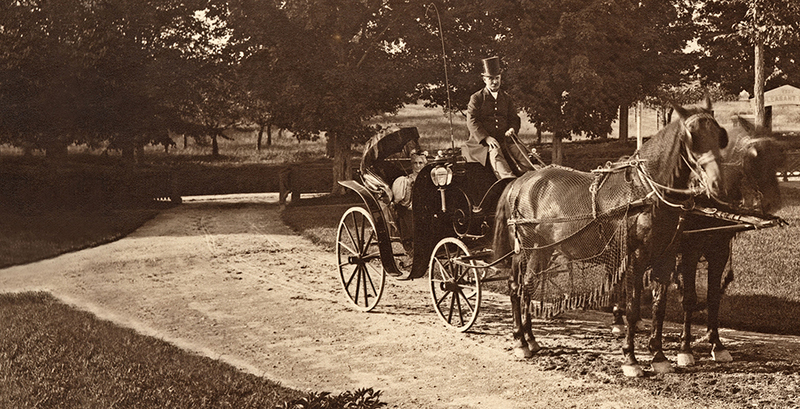 Designed to be drawn by a pair of horses, the carriage was equipped with a “calash” top (folding hood), a convertible-style that made it perfect for summer drives. A fine day for a ride: Mrs. Eddy on the front drive at Pleasant View, circa 1896. Photograph, P0024-7, Longyear Museum collection. 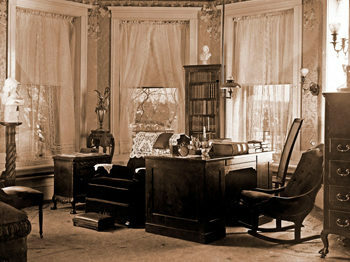 Mary Baker Eddy looked forward to her daily drives, both in Concord, New Hampshire, and later in Chestnut Hill, Massachusetts. In this photo, Calvin Frye is at the reins, guiding horses Dolly and Princess. 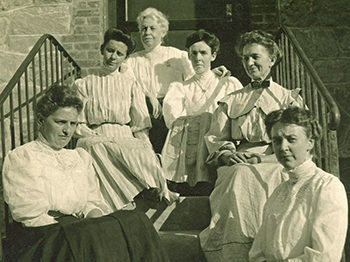 Left: Mrs. Eddy in the Victoria, circa 1896. 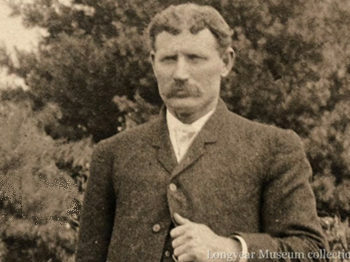 Photograph, P0024-5, Longyear Museum collection. Right: Carriage and lantern detail. The Victoria’s distinctive design includes graceful curves, artful scrollwork, and ornamental detail on the lanterns. 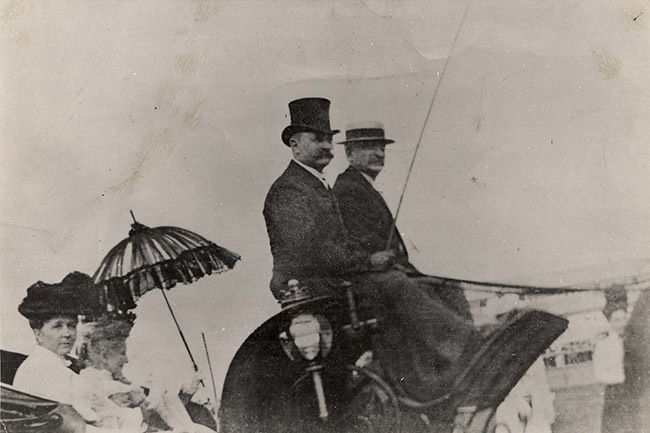 A smiling Mrs. Eddy (holding parasol) takes in the 1900 State Fair in Concord. Photograph, P0029-2, Longyear Museum collection. 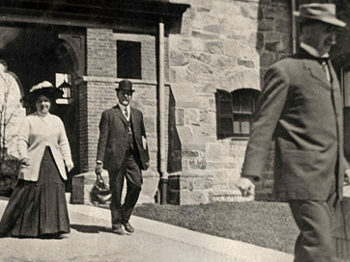 In 1900, Mrs. Eddy was driven to the fairgrounds in her Victoria, along with the First Reader of The Mother Church (Judge Septimus Hanna, in straw boater hat) and his wife (Camilla Hanna, far left). “By her personal appearance at the Concord Fair,” noted Rev. Irving Tomlinson, “Mrs. 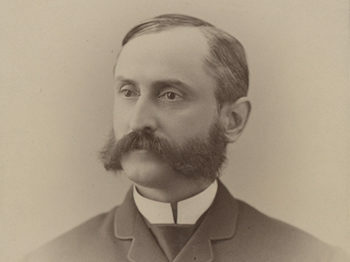 Eddy expressed a normal, happy interest in the affairs of her native state.” Coachman August Mann is at the reins. 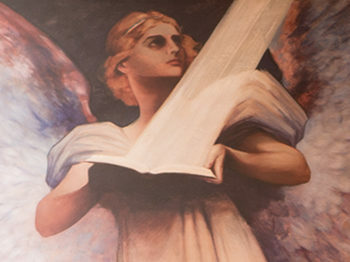 Irving C. Tomlinson, Twelve Years with Mary Baker Eddy, Amplified Edition (Boston: The Christian Science Publishing Society, 1994), 240-241. The carriage is wheeled into its once and present home. 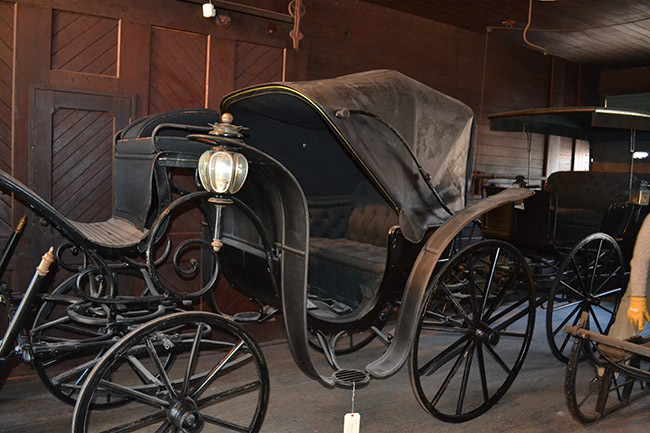 The Victoria is on display in the Carriage House at 400 Beacon Street, alongside a number of other carriages and sleighs that belonged to Mrs. Eddy. 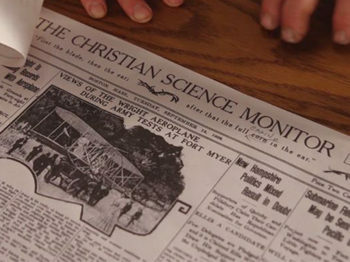 The trustees and staff of Longyear Museum extend their heartfelt thanks to The First Church of Christ, Scientist, in Boston for their generous gift. 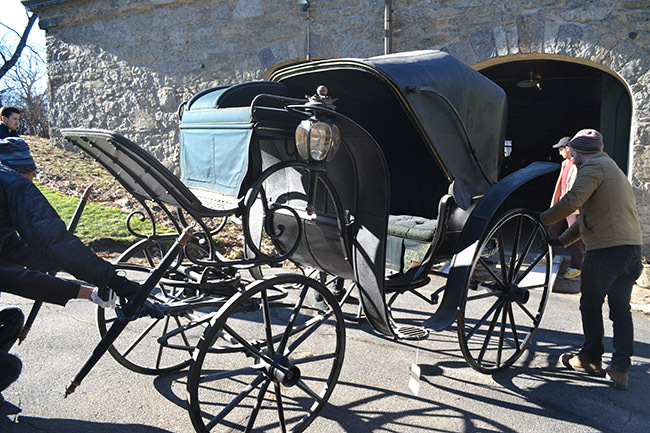 We look forward to welcoming visitors interested in viewing the Victoria carriage, which may be seen at 400 Beacon Street, and the Brougham carriage on display at the Museum.